We are a leading Manufacturer of automatic linear vial washing machine, pharmaceutical glass vial washing machine, automatic linear vial washer, automatic linear glass vial washing machine and online linear vial washing machine from Ahmedabad, India. We are a well-recognized name when it comes to manufacturing Automatic Linear Vial Washing Machine. These Pharmaceutical Washing Machines are flawlessly designed in sync with set industrial norms. Further, these Vial Washing Machines are provided with high-grade components and compatible for washing the pharmaceutical vials automatically and promptly. Our proficiency lies in customizing these machines in accordance with clients' specific demands. Containers Feed on the departing station (Optional) are received on a Unscrambler through visual inspection unit (optional). An in-feed worm inverts container to neck down position and feed them through a specially designed indexing device. The device carries the container forward and stops. Nozzles carrier enter into the container and activities the jet of water/air. The air/water flow is deactivated after the washing cycle is over. Device indexes the vials for next wash.
A separate pumping station (optional) give the right quantum of water at the desired pressure. 5. Washed containers are again inverted to neck upward position to collect in Trays/directly feed to Tunnel. We deal in Pharmaceutical Glass Vial Washing Machine. Owing to features like easy loading and unloading, easy installation and higher capacity, these are appreciated among our clients. We are highly recognized firm instrumental in manufacturing and supplying Automatic Linear Vial Washer. 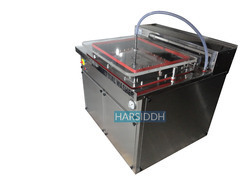 Our offered machines are well-known for excellent finishing and high-end functionality due to their fabrication being done as per latest industrial norms with use of advanced technology. Widely used in pharmaceutical industries, these machines are available with us in diverse specifications for serving divergent needs of customers. High pressure spray nozzles enter into the vials & ensure perfect wash. Totally fabricated from high quality SS materials including the basic frame. No change of parts required for washing of vials (5ml to 30ml), hence saving time of change over. All parts coming in contact with washing zones / jets are made from SS 316 material. Water re-cycling arrangement is possible as per customer’s requirement. Machine is totally robust and withstand continuous operation for long working hours without any trouble. 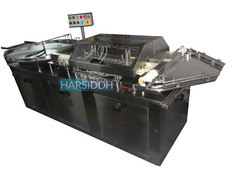 Machine is equipped with PLC system & printing facility with passwords. 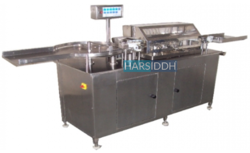 Harsiddh Sterilepack is a recognized brand in the supply vial washing machines. The two popular automatic linear vial washing machines are the HLVW-150 and the HLVW-80 model. 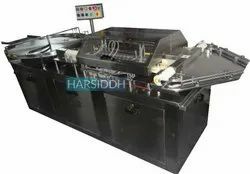 The HLVW- 150 has a throughput of 60-150 vials per minute while the HLVW-80 model has capacity of 40 to 80 vials per minute depending on vial size that ranges from 2ml to 20ml. The loading, cleaning and exit mechanisms are automatic and this increases the cleaning throughput and ensures minimum handling and contamination. The machines have a specially designed in-feed worm wheel that inverts vials and holds them on an indexing device ready for the first wash. The washing cycle is achieved through water and air nozzles that are directed on the inverted vials for maximum cleaning. The specially designed pumps supply water to nozzles at high pressure to effect the cleaning. The devices are specially designed to perform 7 washing cycles depending on the user preferences and type of vial be cleaned. Parts that come into contact with the vials are manufactured from stainless steel SS316 and meet the cGMP standards for pharmaceutical and chemical manufacturing processes. ü Linear left to right direction. ü Indexing linear chain mechanism. ü Automatic in feed of vials through un-scrambler. ü Machine Provides 4 Water Washes & 3 Air Washes. ü Separate pumping systems provide high pressure jets. ü All contact parts made from SS316L. ü Entire Frame Covers & Non-contact parts made out from SS 304.
ü Nozzles Enter into the container during washing cycle to meet cGMP Requirement.